Life at Crich Tramway Village is rich and varied and is illustrated by the wide range of events and special occasions we hold throughout the year. Our recreations of the 1940s and Edwardian Era all add their own unique atmosphere to Crich Tramway Village, as you are transported back in time. Families won’t want to miss events such as Beside the Seaside when we bring a taste of the British seaside to Derbyshire, and our end of season Starlight Specials which will be a rare opportunity to ride our trams at night, and see the village lit up with illuminations. 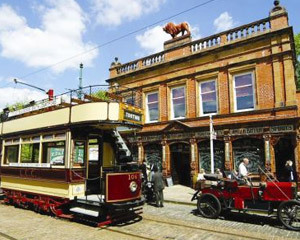 Our Best of Sheffield and Electric 50 events, will focus our attention on our nationally renowned tramcar collection, as we celebrate 50 years of operating electric tramcars at the Museum.